Zero Suit Samus currently in shieldstun from Snake's jab. Shieldstun is an inactionable period that occurs when a character's shield is hit. 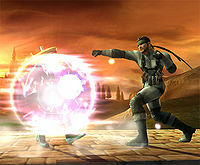 It is comparable to hitstun, in that it occurs after hitlag and only for the defending character. While the attacker still experiences the hitlag of the move, they do not undergo shieldstun, allowing them to move again before their opponent can if the ending lag of the attack is low. During the period of shieldstun, the shielding player cannot perform any of their normal out of shield options, rendering them stuck. Many multiple-hit moves that hit rapidly (such as Fox's or Yoshi's down aerials) hit fast enough to keep an opponent in shieldstun for the duration of the move, as each hit lands while the opponent is still in shieldstun from the previous hit. In addition to not being able to perform out of shield options, players in shield stun cannot release the shield, adjust the tilt of their shield, shield drop, or change their shield's density. Attempting to perform any of these actions while in shieldstun will have them happen the frame shieldstun ends instead. With the inability to jump, grab, roll, or spot dodge out of their shield, the player in shieldstun is very susceptible to another hit or a grab. Though it is rare, this can sometimes be used to the point of breaking a player's shield, as with Fox's and Falco's pillaring combos. A combo meant to lock an opponent in shield until their shield breaks is known as a shield break combo. However, outside of SSB, these combos are not perfect, as all other combos on shield have gaps in shieldstun. Thus, the goal of shield combos in Melee is rarely to outright break shields: it is far more likely an attempt at causing a shield poke, or to bait and punish a roll, grab, or spotdodge. Still, since gaps in shieldstun must exist it is necessary to mixup where and for how long these gaps fall. Doing so covers different out of shield options that the defending player might want to use. As an example, a double shine covers the grab-sized gap that is normally left after a waveshine or a jump out of shine into an aerial, and grants the attacker the hit they were looking for. In SSB, shieldstun is extremely high. When hit on shield, the majority of moves (especially aerials) leave the defending player in such a long period of shieldstun, that another hit is nearly always guaranteed. This, along with the lack of perfect shielding, makes shield break combos easier and far more frequent. Some moves, such as Kirby's up tilt, are notorious for breaking shields on their own with repeated use. The formula for frames of shieldstun in SSB is d * 1.62 + 4 (rounded down), where d is the amount of damage the attack would deal if it was unshielded (shield damage dealt by the move is not factored into this formula). In Melee, shieldstun duration in general was reduced. The formula for frames of shieldstun in Melee is (d + 4.45) * 0.447 rounded down, where d is the amount of damage the attack would deal if it was unshielded (shield damage dealt by the move is not factored into this formula). This amount of shieldstun, while heavily reduced, is still sufficient to leave smart and quick attackers at an advantage. Many moves are unsafe on shield, and it is possible for defending players to capitalize on such hits. But many moves, especially certain aerials, are still safe. Pressuring an opponent's shield is challenging and risky, but highly rewarding. Often, despite a move merely breaking even on shield, or even being a few frames negative, the attacker will still have an advantage. Options out of shield, especially movement, are so limited that good spacing or quick dash dancing out of lag allow the attacker to safely pressure despite frame disadvantage. It is possible to shield buffer some evasive options out of shield in Melee by holding the C-stick while in shieldstun. The character will then jump (if held upwards), spot dodge (if held downwards) or roll (if held sideways) on the first frame after they leave shieldstun. Yoshi is a notable exception to this rule. While he cannot jump out of shield in this iteration, he suffers no shieldstun whatsoever, which, combined with the other unique properties of his shield, give his shield game a very different dynamic to the rest of the cast. In Brawl, shieldstun was further reduced. Very few (if any) attacks on shield are safe. Combined with the lowered time to drop shield (taking 7 frames instead of 15), this means that hitting shields in Brawl puts attackers in a very vulnerable position. The approximate formula for frames of shieldstun in Brawl is d * 0.375 rounded down (shield damage dealt by the move is not factored into this formula). In Smash 4, shieldstun was originally thought to have been reduced again from Brawl, but further testing showed this to be false. The working formula for shieldstun duration in Smash 4 prior to patch 1.1.1 was originally d * 0.39 rounded down (bonus shield damage dealt by the move is not factored into the formula), which results in barely higher shieldstun compared to Brawl . However, following patch 1.1.1, shieldstun from direct attacks was increased dramatically, to the point of being higher than in Melee. The new formula is d * 0.58 + 2 rounded down, and for indirect attacks (such as projectiles), the formula is now d * 0.29 + 2. Although the increased shieldstun makes attacks safer on shield than in the game's initial release, attacks in Smash 4 are generally less safe than in Brawl because of less lenient autocancel windows and less shield pushback; these factors may have been responsible for many thinking that shieldstun had been decreased prior to the patch. Powershielding further multiplies the amount of shieldstun by 0.66, so, for versions 1.1.1 and later, the formula is d * 0.3828 + 2 for direct attacks and d * 0.1914 + 2 for indirect attacks when the attack is powershielded. Version 1.1.3 of the game added an additional wrinkle to shieldstun: if a character is trapped in shieldstun for 10 hits, they are allowed to cancel it with a roll or spot dodge, and the intangibility of either option comes out immediately on frame 1, regardless of their coded startup. Practically, there are very few moves that can hit a shield enough times for this to trigger; the looping hit of a charging Aura Sphere is the most noticeable. In the case of said move, this mechanic allows shielding characters to escape it if they are trapped by it at the ledge, where they would otherwise be forced to shield SDI or have their shield broken. Smash attacks use a multiplier of 0.725, effectively resulting in the same 0.58 multiplier from Smash 4. Aerial attacks (with the exception of grab aerials) use a multiplier of 0.33, resulting in an overall multiplier of 0.264. Projectiles use a multiplier of 0.29, resulting in an overall multiplier of 0.232. For smash and aerial attacks that are also projectiles (such as Mega Man's forward smash and down aerial), only this multiplier applies. In other cases, the multiplier is by default 1. However, specific characters' moves that are not in the above categories can also have their own shieldstun multiplier. An example is Mewtwo's dash attack, which has a shieldstun multiplier of 1.3×, or 1.875× prior to update 2.0.0. Several characters' rapid jabs possess unique multipliers as well. As a result, shieldstun remains unchanged for smash attacks compared to Smash 4, but is increased for direct special moves and all other ground attacks; tilt attacks in particular are noticeably safer on shield. Conversely, it is decreased for aerial attacks and projectiles, most significantly the former. The new 0.85× damage multiplier for aerial attacks performed in a short hop also further reduces their shieldstun potential. However, due to the universally lower landing lag in Ultimate, the general safety of aerial attacks on shield remains unchanged, with some of them being slightly safer. Furthermore, shield dropping takes longer (11 frames instead of 7), while shield grabbing after shieldstun has increased startup by 4 frames, and although the new powershield mechanics allow characters to retaliate against attacks faster, it is harder to pull off, as it is now triggered by dropping the shield instead of putting it up. Overall, attacking shields in Ultimate is more favorable, with options to safely punish out of shield being riskier (albeit still highly rewarding), encouraging players to focus more on offense. The ability to cancel shieldstun with a roll or spot dodge after being locked in it for 10 hits returns from Smash 4, and is now applicable to several other moves, most remarkably every rapid jab, due to their increased shieldstun and much faster hit rate. This renders it vastly more useful in punishing such moves, as in the case of rapid jabs, the shielding character can usually roll behind the attacker, who will then be forced to unleash their rapid jab's finisher and thus become much more vulnerable. This mechanic's larger notoriety has led to it being often referred to as shieldstun canceling. This page was last edited on March 21, 2019, at 21:15.